(PRLEAP.COM) November 17, 2015 - Bill.com, the leading company creating magically simple business payments, today announced during SleeterCon 2015 that The Sleeter Group has named the Bill.com iOS mobile app a 2016 Awesome Application. The app, released in June, provides a seamless mobile solution for managing and paying bills on the go. The Sleeter Group's Awesome Application Award Program recognizes the highest-quality software solutions available in the SMB accounting software marketplace. A panel of experienced accounting software and business process experts evaluate each product based on how it integrates with other parts of the accounting and business process systems, its market reputation and how it implements best practices for integration with QuickBooks and other software solutions. Their evaluations, along with online voting results, determine which solutions earn the designation of an Awesome Application. "We feel very honored to have the Bill.com iOS app recognized with a Sleeter Awesome Application Award," said Konstantinos Giannakis, Director of User Experience and Mobile Product Lead for Bill.com. "We know Bill.com users are on the go and want to be able to approve and pay bills at a moment's notice." The Bill.com app, optimized for iOS mobile devices, provides accounting professionals and their business clients with the tools they need to manage their A/P and A/R payments in today's "anytime, anywhere" business environment. Users can view payments and make informed payment decisions while on the go, thereby saving up to 50-70 percent of the time it would normally take to manage the same tasks with traditional bookkeeping. "As our clients' outsourced accounting department, we need to be quick to respond to accounts payable issues that come up. The Bill.com mobile app makes it easy for our accountants to stay on top of bill approvals on the go. It also makes it super convenient for our clients to schedule payments. Being able to eliminate paper checks and run the entire accounts payable process in the cloud and on mobile is a huge value-add for our clients," said Blake Oliver, director of Technology & Marketing at HPC Accounting & Tax. 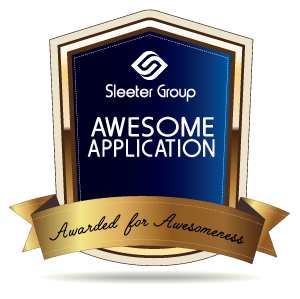 To learn more about The Sleeter Group's Awesome Application Award Program, visit http://www.sleeter.com/awesomeapps/2016/bill-com. Bill.com will be exhibiting at SleeterCon 2015 in Las Vegas now through November 19. You can view a demonstration of its iOS app by visiting the company at booth number 441. Bill.com (www.bill.com) is the leading digital business payments company creating magically simple A/P and A/R solutions. We are at the center of business payments, uniting banks and businesses on the fastest growing payments network. Bill.com helps over 600,000 network members process over $20 billion in payments per year and saves companies up to 50 percent of the time typically spent on financial back-office operations by securely automating their end-to-end processes. Three of the top ten U.S. banks and 41 percent of the top 100 accounting firms rely on Bill.com as their primary payments solution. The recipient of more than 40 awards, Bill.com was recently recognized as one of the San Francisco Business Time's Most Innovative Companies and proudly received a PC Magazine's Editor's Choice Award. For more information, please visit www.bill.com.